Graphic authorship is taken for granted by many design theorists and it is gaining ground within practice, too. But the idea has received little sustained examination. What does it mean and what is really possible? Authorship has become a popular term in graphic design circles, especially in those at the edges of the profession: the design academies and the murky territory between design and art. The word has an important ring to it, with seductive connotations of origination and agency. But the question of how designers become authors is a difficult one. and exactly who qualifies and what authored design might look like depends on how you define the term and determine admission into the pantheon. Authorship may suggest new approaches to the issue of the design process in a profession traditionally associated more with the communication rather than the origination of messages. But theories of authorship also serve as legitimising strategies, and authorial aspirations may end up reinforcing certain conservative notions of design production and subjectivity – ideas that run counter to recent critical attempts to overthrow the perception of design as based on individual brilliance. The implications of such a re-definition deserve careful scrutiny. What does it really mean to call for a graphic designer to be an author? Foucault demonstrated that over the centuries the relationship between the author and the text has changed. The earliest sacred texts are authorless, their origins lost in history. In fact, the ancient, anonymous origin of such texts serves as a kind of authentication. On the other hand, scientific texts, at least until after the Renaissance, demanded an author’s name as validation. By the eighteenth century, however, Foucault asserts, the situation had reversed: literature was authored and science had become the product of anonymous objectivity. Once authors began to be punished for their writing – that is, when a text could be transgressive – the link between the author and the text was firmly established. Text became a kind of private property, owned by the author, and a critical theory developed which reinforced that relationship, searching for keys to the text in the life and intention of its writer. With the rise of scientific method, on the other hand, scientific texts and mathematical proofs were no longer seen as authored texts but as discovered truths. The scientist revealed an extant phenomenon, a fact anyone faced with the same conditions would have uncovered. Therefore the scientist and mathematician could be the first to discover a paradigm, and lend their name to it, but could never claim authorship over it. Post-structuralist readings tend to criticise the prestige attributed to the figure of the author. The focus shifts from the author’s intention to the internal workings of the writing: not what it means but how it means. Barthes ends his essay supposing ‘the birth of the reader must be at the cost of the death of the Author’. (4) Foucault imagines a time when we might ask, ‘What difference does it make who is speaking?’(5) The notion that a text is a line of words that releases a single meaning, the central message of and author / god, is overthrown. Perhaps after years as faceless facilitators, designers were ready to speak out. Some may have been eager to discard the internal affairs of formalism – to borrow a metaphor used by Paul de Man – and branch out into the foreign affairs of external politics and content. (10) By the 1970s Design had begun to discard the scientific approach that had held sway for decades, exemplified by the rationalist ideology that preached strict adherence to an eternal grid. Muller-Brockmann’s evocation of the ‘aesthetic quality of mathematical thinking’ is the clearest and most cited example of this approach. (11) Muller-Brockmann and a slew of fellow researchers such as Kepes, Dondis and Arnheim worked to uncover a pre-existing order and form in the way a scientist reveals ‘truth’. But what is most peculiar and revealing in Muller Brockmann’s writing is his reliance on tropes of submission: the designers submits to the will of the system, forgoes personality, withholds interpretation. On the surface, at least, it would seem that designers were moving away from authorless, scientific texts – in which inviolable visual principles arrived at through extensive visual research were revealed – towards a position in which the designer could claim some level of ownership over the message (and this at a time when literary theory was moving away from that very position). But some of the institutional features of design practice are at odds with zealous attempts at self-expression. The idea of a decentred message does not necessarily sit well in a professional relationship in which the client is paying the designer to convey specific information or emotions. In addition, most design is done in a collaborative setting, either within a client relationship or in the context of a studio that utilises the talents of numerous creative people, with the result that the origin of any particular idea is uncertain. The ever-present pressure of technology and electronic communication only muddies the water further. Is there an auteur in the house? It is perhaps not surprising that Barthes’ ‘The Death of the Author’ was written in Paris in 1968, the year students joined workers on the barricades in a general strike and the western world flirted with real social revolution. The call for the overthrow of authority in the form of the author in favour of the reader – i.e. the masses – had a real resonance in 1968. But to lose power you must have already worn a mantle, which is perhaps why designers had a problem in trying to overthrow a power which they never possessed. The figure of the author implied a totalitarian control over creative activity and seemed an essential ingredient of high art. If the relative level of genius – on the part of the author, painter, sculptor or composer – was the ultimate measure of artistic achievement, activities that lacked a clear central authority figure were devalued. The development of film theory during the period serves as an interesting example. In 1954 film critic and budding film director François Truffaut had first promulgated the ‘politique des auteurs’, a polemical strategy developed to reconfigure a critical theory of the cinema. (12) The problem was how to create a theory that imagined a film, necessarily the result of broad collaboration, as the work of a single artist, thus a work of art. The solution was to determine a set of criteria that allowed a critic to define certain directors as auteurs. In order to establish the film as a work of art, auteur theory held that the director – hitherto merely one third of the creative troika of director, writer and cinematographer – had ultimate control over the entire project. Auteur theory – especially as espoused by the American critic Andrew Saris – speculated that directors must meet three criteria in order to pass into the sacred hall of auteurs. (13) Sarris proposed that the director must demonstrate technical expertise, have a stylistic signature that is visible over the course of several films and, through his or her choice of projects and cinematic treatment, show a consistency of vision and interior meaning. Since the film director had little control of the material he or she worked with – especially within the Hollywood studio system, where directors were assigned to projects – the signature way a range of scripts was treated was especially important. The interesting thing about auteur theory is that film theorists, like designers, had to construct the notion of the author as a means of raising what was considered low entertainment to the plateau of fine art. The parallels between film direction and design practice are striking. Like the film director, the art director or designer is often distanced from his or her material and works collaboratively on it, directing the activity of a number of other creative people. In addition, over the course of a career both the film director and the designer work on a number of different projects with varying levels of creative potential. As a result, any inner meaning must come from aesthetic treatment as much as from content. If we apply the criteria used to identify auteurs to graphic designers, we yield a body of work that may be elevated to auteur status. Technical proficiency could be claimed by any number of practitioners, but couple this with a signature style and the field narrows. The designers who fulfil these criteria will be familiar to any Eye reader; many of them have been featured in the magazine. (And, of course, selective republishing of certain work and exclusion of other construct a stylistically consistent oeuvre.) The list would probably include Fabian Baron, Tibor Kalman, David Carson, Neville Brody, Edward Fella, Anthon Beeke, Pierre Bernard, Gert Dunbar, Tadanoori Yokoo, Vaughn Oliver, Rick Valincenti, April Greiman, Jan van Toorn, Wolfgang Weingart and many others. But great technique and style alone do not an auteur make. If we add the requirement of interior meaning, how does this list fare? Are there designers who by special treatment and choice of projects approach the issue of deeper meaning in the way Bergman, Hitchcock or Welles does? How do you compare a film poster with the film itself? The very scale of a cinematic project allows for a sweep of vision not possible in graphic design. Therefore graphic auteurs, almost by definition, would have to have produced large established bodies of work in which discernible patterns emerge. Who, then, are the graphic auteurs? Perhaps Bernard and Van Toorn, possibly Oliver, Beeke and Fella. There is a sense of getting a bigger idea, a deeper quality to their work, aided in the case of Bernard and van Toorn by their political affiliations and in Oliver by long association that produces a consistent genre of music, allowing for a range of experimentation. In these cases the graphic auteur both seeks projects he is commissioned to work on from a specific, recognisable critical perspective. Van Toorn will look at a brief for a corporate annual report from a socio-economic position, Bernard evokes a position of class struggle, capitalist brutality and social dysfunction and Oliver examines dark issues of decay, rapture and the human body. Jean Renoir observed that an artistic director spends his whole career remaking variations on the same film. Great stylists such as Carson and Baron do not seem to qualify for admission to the auteur pantheon, at least according to Sarris’s criteria, as it is difficult to discern a message in their work that transcends the stylistic elegance of the typography in the case of Baron and the studied inelegance of that of Carson. (You have to ask yourself, ‘What is their work about?’) Valicenti and Brody try to inject inner meaning into their work - as in Valicenti’s self published Aids advertising and Brody’s attachment to the post-linguistic alphabet systems - but their output remains impervious to any such intrusion. A judgement such as this, however, brings us to the Achilles’ heel of auteur theory. In trying to describe interior meaning, Sarris resorts to ‘the intangible difference between one personality and another’. (14) That retreat to intangibility – the ‘I can’t say what it is but I know it when I see it’ aspect – is one of the reasons why the theory has long since fallen into disfavour in film criticism circles. It also never dealt adequately with the collaborative nature of cinema and the messy problems of movie-making. But while the theory is passé, its effect is still with us: the director to this day sits squarely at the centre of our perception of film structure. In the same way it could be that we have been applying a modified graphic auteur theory for years without being aware of it. After all, what is design theory if not a series of critical elevations and demotions as our attitudes about style, meaning and significance evolve? Auteur theory maybe too limited a model for our current image of design authorship, but there are other ways to frame the issue based on different kinds of practice: the artist’s book, concrete poetry, political activism, publishing, illustration and so on. Could a theory of poetics be a functional model? Use is a major sticking point in trying to view designed work as poetic: traditionally the poem as artwork is a self-contained artefact, while design refers to some exterior function or overt intention. This poetic / practical opposition is resolved in two examples of design production: the artist’s book and activist design. The artist’s book offers a form of design authorship from which function has been fully exorcised. The artist’s book, in general, is concrete, self-referential and allows for a range of visual experiments without the burden of fulfilling mundane commercial tasks. There is a long tradition of artists’ books through the historical avant-garde, the Situationists, Fluxus and experimental publishing in the 1960s and 1970s. Its exponents include an eclectic mix of designers and authors (Dieter Rot, Tom Phillips, Warren Lehrer, Tom Ockerse, Johanna Drucker) as well as visual artists (Robert Morris, Barbara Kruger, Mary Kelly, Jenny Holzer, Hans Haacke). Dieter Rot has produced a monumental and consistent body of books which explore in a self-reflexive way, the nature of books. Lehrer has focused on production processes, such as printing and binding, and aspects of dialogue and narrative. He has recently produced a new group of graphic portraits, distributed in the form of trade paperback, perhaps the most recent attempt at wide distribution. Artists’ books – using words, images, structure and material to tell a story or invoke an emotion – may be the purest form of graphic authorship. But the odd thing about the genre is that many of the most skilled designers have avoided it and much of the work produced under the rubrik is of sub-standard graphic quality (not in terms of production values, which are often necessarily low, but in typography and composition). The singularity of the artist’s book, the low technical quality and the absence of a practical application may alienate the professional graphic designer. If the difference between poetry and practical messages is that the latter are successful only when we correctly infer the intention., then activist design would be labelled as absolutely practical. But activist work – including the work of Gran Fury, Bureau, Woman’s Action Coalition, General Idea, ACT-UP, Class Action and Guerilla Girls – is also self-motivated and self-authored with a clear political agenda. Proactive work has a voice and a message, but in its overt intentionality lacks the self-referentiality of the artist’s book. Yet several problems cloud the issue of authored activism, not least the question of collaboration. Whose voice is speaking? Not an individual, but some kind of unified community. Is this work open for interpretation or is its point the brutal transmission of a specific message? The rise of activist authorship has complicated the whole idea of authorship as a kind of free self-expression. Perhaps the graphic author is one that writes and publishes material about design – Joseph Muller-Brockmann or Rudy VanderLans, Paul Rand or Erik Spiekermann, William Morris or Neville Brody, Robin Kinross or Ellen Lupton. The entrepreneurial arm of authorship affords the possibility of a personal voice and wide distribution. Most split the activities into three discreet actions: editing, writing and designing. Even as their own clients, the design remains the vehicle of the written thought. (Kinross, for instance, works as a historian then changes hats and becomes a typographer.) Rudy VanderLans is perhaps the purest of the entrepreneurial authors, since in Emigre all three activities blend into a continuous whole. In Emigre the content is deeply embedded in the form – that is, the formal exploration is as much the content of the magazine as the writing. VanderLans expresses his message through the selection of the material (as an editor), the content of the writing (as a writer) and the form of the pages and typography (as a form-giver). Ellen Lupton and her partner J. Abbott Miller have almost single-handedly constructed the new critical approach to graphic design, coupled with an exploratory practice. A project such as ‘The Bathroom, the Kitchen and the Aesthetics of Waste’, an exhibition at the MIT List Visual Arts Centre, seems to approach a new level of graphic authorship. The message is expressed equally through graphic / visual devices and text. The design of the show evokes the issues that are its content; it is clearly self-reflexive. (The exhibition catalogue, by contrast, does not embody the same level of graphic authorship. Here Lupton seem to have slipped back into the more familiar, functionally separate roles of author and designer.) But much of their other work demands to be reckoned with, visually and verbally. While Lupton and Miller‘’s work is primarily critical – a reading of exterior social and historical phenomena directed at a specific audience – the illustrated book, often overlooked by the design community, is almost entirely concerned with the generation of creative narrative. Books for children have been one of the most successful outlets, but author / illustrators such as Sue Coe, Art Spiegelmann, Charles Burns, Ben Katchor, Dave McCaulley, Chris van Allesburg, Edward Gorey and Maurice Sendak have also used the book in wholly inventive ways and produced serious work. Books such as Speigelmann’s Maus and Coe’s X and Porkopolis expand the form into new areas. Other models that may indicate a level of graphic authorship include projects of such a scale that the designer is called on to make sense of a sea of material and construct narrative. Bruce Mau’s work with Rem Koolhaas on the gigantic S,M,L,XL, an architectural and typographic ‘novel’ (see Eye no.15 vol.4), and Irma Boom’s five-year commission from a powerful Dutch corporation to create a commemorative work of unspecified form, scale and content are two such projects. Here the designer – working like a film director on the unfolding cinematic structure of the work – assumes a primary position in the shaping of material. The final category is that of designers who use the medium of professional graphic design to create self-referential statements and comparisons. 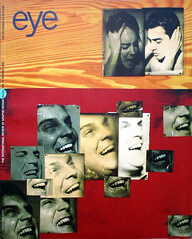 Examples include April Greiman’s special issue of Design Quarterly, a full-scale image of her pixellated body with a personal text full of dreams and visions, and any number of intricate and enigmatic works by the likes of Tom Bonauro and Allen Hori (for instance, Hori’s graphic interpretation of a Beatrice Warde essay in a recent Mohawk paper promotion). Operating in a space between service-orientated projects and free expression, these works eschew the parameters of a client relationship while retaining the forms dictated by the needs of commerce: the book, poster, exhibition and so on. In the case of Hori’s visual essay, the client pays for a graphic work to embellish a corporate project and the designer lends his avant-garde credentials to the corporation. If the ways a designer can be an author are complex and confused, the way designers have used the term and the value ascribed to it are equally so. Any number of recent statements claim authorship as the panacea to the woes of the brow-beaten designer. A recent call for entries for a design exhibition entitled ‘Designer as Author: Voices and Visions’ sought to identify ‘graphic designers who are engaged in work that transcends the traditional service-oriented commercial production, and who pursue projects that are personal, social or investigative in nature’(15) The rejection of the role of the facilitator and call to ‘transcend’ traditional production imply that the authored design holds some higher, purer purpose. The amplification of the personal voice legitimises design as equal to more traditional privileged forms of authorship. But if designers should aim for open readings and free textual interpretations – as a litany of contemporary theorists have convinced us – that desire is thwarted by oppositional theories of authorship. Foucault noted that the figure of the author is not a particularly liberating one: the author as origin, authority and ultimate owner of the text guards against free will of the reader. Transferring the authority of the text back over to the author contains and categorises the work, narrowing the possibilities for interpretation. The figure of the author reconfirms the traditional idea of the genius creator; the status of the creator frames the work and imbues it with mythical value. On the other hand work is created by someone. (All those calls for the death of the author are made by famous authors.) While the development and definition of artistic styles, and their identification and classification, are at the heart of an outmoded Modernist criticism, we must still work to engage these problems in new ways. It may be that the real challenge is to embrace the multiplicity of methods – artistic and commercial, individual and collaborative – that comprises design language. An examination of the designer-as-author could help us to rethink process, expand design methods and elaborate our historical frame to incorporate all forms of graphic discourse. But while theories of graphic authorship may change the way work is made, the primary concern of both the viewer and the critic is not who made it, but rather what it does and how it does it. (4) Barthes, op. cit, p145.